Jayne Bratton of The Bratton Group won the MBA Member of the Month. Jayne collected the award from Kimmi Crosby, Chairman of the MBA, during the Evening networking event in December. The prize included a bottle of fizz and one whole month of free publicity across all of the MBA social media. 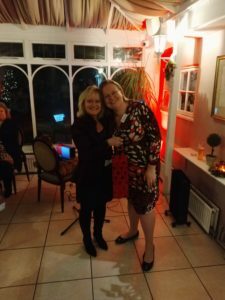 Caroline Banwell – Harmony HR Solutions. June 2018 Winner. Matthew Baxter – Format Computer Services. May 2018 Winner. Mike Linnette – the South Cambridgeshire District Council Candidate Melbourn Area. March 2018 Winner. Martin Bessell – Melbourn Ironing Services . February 2018 Winner. John More – Asset & Systems Support Management. December 2017 Winner. Sarah Hillman – Enabling Growth . November 2017 Winner. Norman Shires – AV Engineering Services Ltd. October 2017 Winner. Katie Nash – The Utility Warehouse . September 2017 Winner.